While these beautiful plants have long been one of the main focal points of Christmas celebrations, they were used in wintertime festivals and grown specifically to decorate royal kings and queens long before they earned their reputation as a Christmas-time plant. Due to its vibrant red color and the fact that it naturally blooms/flowers in early winter, it makes perfect sense why this plant has grown to symbolize the most festive holiday of the year (at least in our culture). When properly cared for, poinsettias will live and retain their vibrant colored leaves for as long as three to four months, and can even be groomed to rebloom each year. While it’s quite simple to care for poinsettias you purchase around the holidays, you must follow strict growing guidelines if you’d like them to rebloom year after year. It’s crucial that you don’t overwater poinsettia plants and that you allow the soil to dry out some between watering. If in a pot cover or foil remove before watering. A newly purchased poinsettia should be set in an area with as much light as possible and away from direct heat and drafts. Day temperatures of 65-80 degrees and night temps of 60 degrees are ideal for maintaining blooming plants. Our team at Bennett’s suggests applying an all-purpose, water-soluble fertilizer every other time you water. Doing this should ensure your poinsettias stay fresh and beautiful at least until the end of January. If you’re hoping for the plant to rebloom the following year, once it’s warm enough (and frost is no longer a threat) place the plant outdoors in a spot that will allow it to soak up as much direct sunlight as possible. This is also the time you should trim the plant back to around half its size (i.e. remove all remaining colored leaves so bare stems are all that remains). Continue watering, fertilizing and caring for the plant through spring, summer and the fall growing season, cutting back any stems that look too long or stringy along the way. Do your best to keep the plant in complete darkness for 12 hours of the day and in bright light for the other 12 hours. Do this for six full weeks to prepare the buds for optimal Christmas-time flowering. 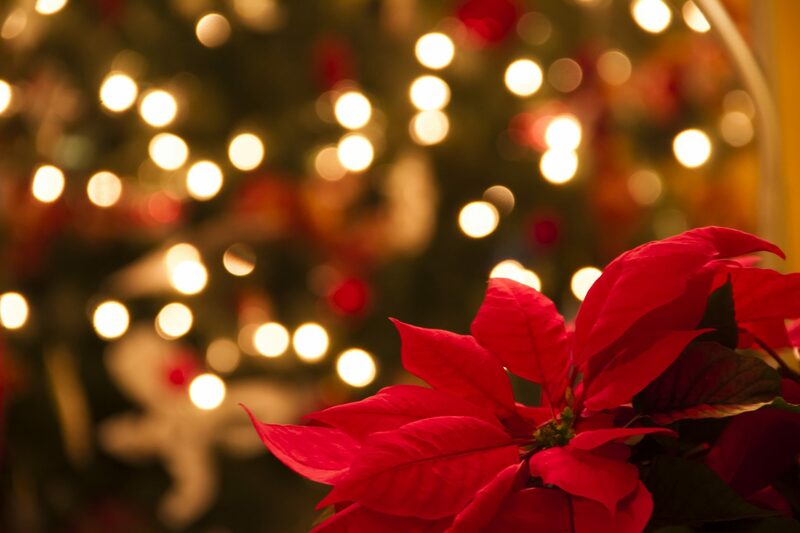 This may sound tedious, but because poinsettias are extremely sensitive to light, even the slightest variation in this light exposure schedule can cause the flowers not to form as they should. By late October/early November, you should begin to see buds forming. At this point, it should be placed in a warm, sunny location to allow it to fully bloom by Christmas. Remember: Poinsettias are mildly toxic to cats and dogs and should be kept out of such pets’ reach at all times. While the level of toxicity is often over-exaggerated, it can indeed irritate your furry friends’ mouth and stomach and occasionally cause vomiting. At Bennett’s Greenhouse, we offer several Ecke poinsettia varietals in a wide range of colors, sizes and forms, giving you the ability to mix and match or deck your home or office out in one solid, festive color. Contact us for more helpful tips and information about poinsettias or to speak with one of our friendly, knowledgeable team members today! We wish you all the happiest of holiday seasons!